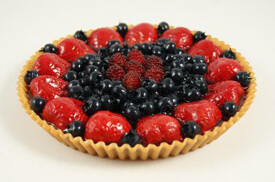 Chef Patrice will teach you how to make the perfect sweet dough for this beautiful fruit tart. Pastry cream is on the list, so get ready to put your pastry skills to the test! This class also features a recipe for Chicken Sausage with Caramelized Apple.